When I got home from A Night for Scotland at Edinburgh’s Usher Hall just four days before the referendum, my ears were ringing and I could hardly feel my feet after a day of campaigning. Yet I felt utterly exhilarated. Exhilarated because I get to be part of the most incredible movement of people grafting to build a better future. It’s a movement which genuinely sets my heart a flutter and which gives me reason to cry with joy and pride on a pretty regular basis. Last night’s event was no different. The gig sold out almost immediately after organiser Tommy Shepherd (the man behind The Stand comedy club) brought together an amazing array of home grown talent to gee up Scotland for the last week of Yes campaigning. Franz Ferdinand, Frightened Rabbit and Mogwai all played sets, as did Amy MacDonald, Eddi Reader and Stanley Odd amongst others. I stood in the stalls, surrounded by Saltires and smiles on the faces of people who had probably been out campaigning all weekend, whether chapping doors, persuading grannies to say aye for #YesGenerations or joining in the rallies in cities across the country. These were people who’ve given every ounce of energy they have to build a fairer, greener, more democratic Scotland and they deserved the party they got. From an utterly electrifying set from Franz Ferdinand (oh my god it’s Franz Ferdinand and they’re right there!) 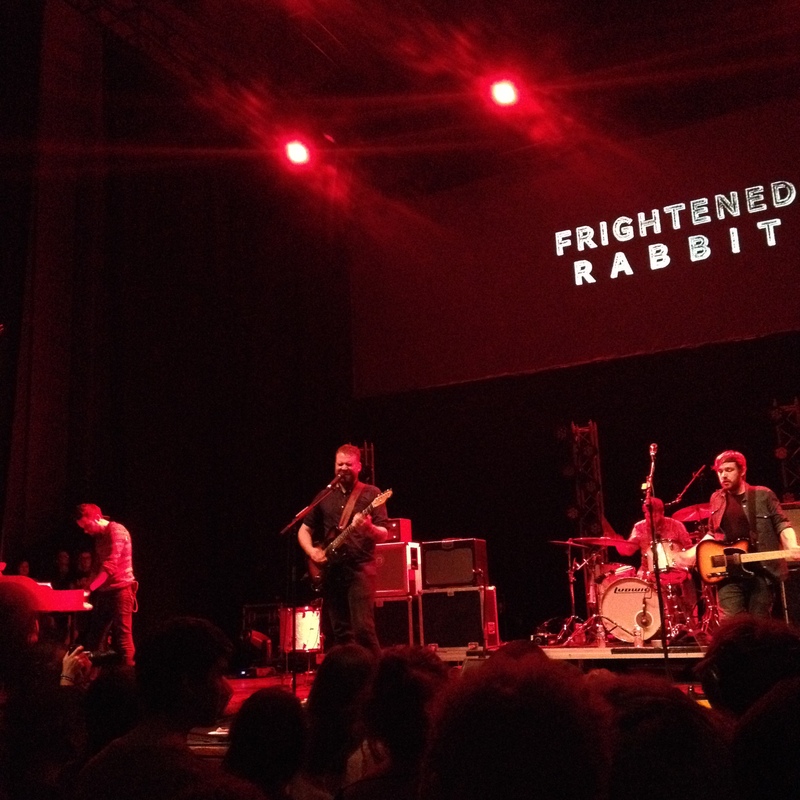 to Frightened Rabbit’s chant worthy set (we were still singing when Elaine C Smith had to shut us up at the end of the night), the songs somehow took on a new meaning in the context of the campaign. Both Alex Kapranos and Scott Hutchison from the bands commented on how every word now felt more poignant. Frightened Rabbit sang of being “Struck dumb by the hand of fear” – something few in the crowd were guilty of, despite the best efforts of the No campaign and the overwhelming majority of the media. Similarly, their huge hit Swim Until You Can’t See Land takes on new meaning with lyrics like “let’s call me a baptist, call this a drowning of the past; she is there on the shoreline throwing stones at my back”. At times, the gig felt like any other with folk jumping about to Mogwai or singing Amy MacDonald’s lyrics back to her. But we all knew we were there to come together one last time before the day which will decide all our futures. A nervous tension was tangible in the crowd, mixed with huge pride at what we’ve already achieved. As Elaine C Smith put it, if we win, it won’t be thanks to the banks or big business, but it’ll be down to the people of Craigmillar, of Pilton, Easterhouse and so many more long neglected communities across Scotland. Despite the outcome, we’ve seen a reawakening, an empowerment like never before of the working class, of the poorest, most forgotten about, most ignored people in this nation.